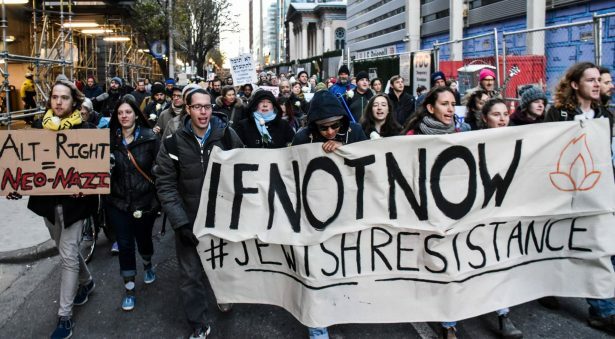 Demonstrations in over 30 U.S. cities on Wednesday called on Jewish institutions to stand against Trump’s hateful rhetoric and appointment of Stephen Bannon. Demonstrators are gathering in over 30 U.S. cities today as part of a “Jewish Day of Resistance” against President-elect Donald Trump and his appointment of Stephen Bannon as chief strategist and senior counselor. The group responsible for organizing the day’s events is IfNotNow, an organization of Jewish youth concerned with the rise of anti-Semitism, Islamophobia and xenophobia characterized by the rhetoric of Trump and his appointees. In New York City, protesters will line up on the Brooklyn Bridge and outside the midtown office of Birthright Israel. In Washington, D.C., protesters already entered the lobby of the Republican Jewish Coalition, or RJC, holding signs to “Draw the Line” against policies that threaten to tear the country apart and calling for the coalition to stand against Bannon. The group was “violently forced” from the building by RJC private security, according to IfNotNow organizer Ethan Miller. The incident was recorded on Facebook Live.